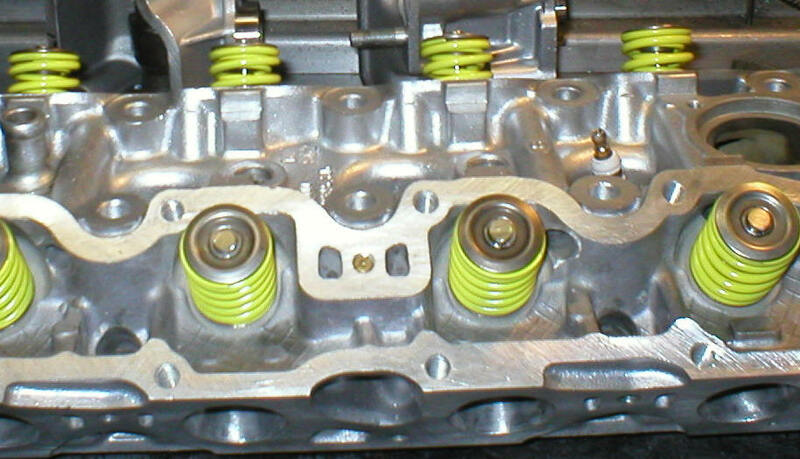 Shown above is OEM prior to porting. Porting and matching improves airflow throughout the RPM range dramatically over Factory. Head shown above has been ported, 4 angle cut on the intake seats, 2 angle cut on the valve, swirl polished with Stainless Steel valves. Exhaust valve seats have been cut with three angles with 2 angle cut on valves (margin optimized for application). All gasket surfaces re-machined, all bearing surfaces honed, cam followers polished, repair of stripped bolt holes with steel inserts, spark plugs threads repaired with steel inserts, all thread holes chased and re-tapped. Valve guides replaced/resized as required, valve tips ground to optimal adjusting-shim size (that can be adjusted now and down the road). Valve springs tested - good to 7,500 RPM (optional high performance springs available for increased RPM and durability), after cleaning exposed surfaces coated with paint for appearance and corrosion resistance. Gaskets and manifolds pin-located to head to properly align gaskets.